After more than six weeks and 982 votes, Skyservice Montréal rose to the top among Canada’s Fixed Base Operators in WINGS’ annual FBO survey, which is designed as an open-voting system for customers to weigh in on their favourite facilities across the country. Now holding four locations, Skyservice began its rise to prominence in Canadian Aviation back in 1986 out of its Montréal facility housed at Pierre Elliott Trudeau International Airport (CYUL). Today, Skyservice also holds a Toronto midfield location opened in 1995 at Lester B. Pearson Airport (CYYZ), another at Calgary International Airport (CYYC), which opened in 2005, and a fourth location purchased in 2016 at Ottawa MacDonald Cartier International Airport (CYOW). The company now manages approximately 73 business jets across its network as part of its key aircraft management business segment, in addition to charter services, maintenance, aircraft brokerage, and FBO segments all working together to form what a formidable industry force after just 33 years of operation. A fifth Skyservice facility is scheduled to join the network in Spring 2019 on the south side of Pearson. This is a greenfield build – one of the first such projects that Canada’s busiest airport has seen in years – with a prime location to service the business and personal aviation needs of Toronto clients. The new Toronto south location will hold a familiar Skyservice 24/7 platform of CSRs, border services, handling and maintenance, mirroring premium FBO functions in Montreal, Calgary and Toronto midfield. This attention to customer detail, safety and convenience has been a hallmark of Skyservice since its early days in Montreal when it first obtained an Aircraft Operating Certificate. At approximately 91,000 square feet, the Toronto south location will also hold familiar hangar space to Montreal, which measures in at around 96,000, and Toronto midfield at around 100,000 – Calgary holds 65,000 square feet of hangar space. The office area of the new location is planned to be around 20,000 square feet, just under the 30,000 square feet of Toronto midfield. 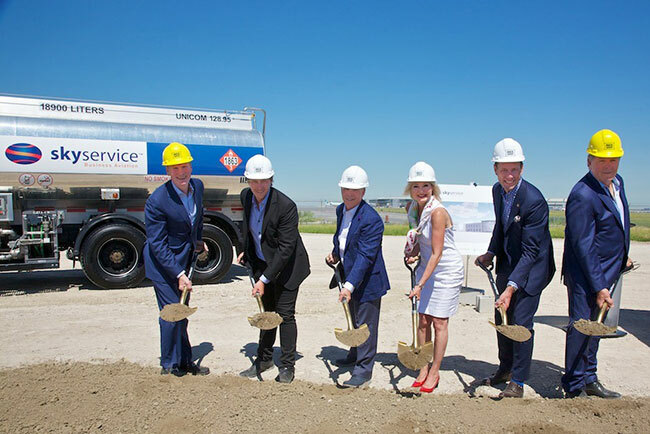 Construction of the south facility is in the hands of the RICE Group, known for building Costcos across Ontario and a range of large industrial projects. RICE’s involvement provides confidence of meeting target dates, which includes completing construction around March 2019 and beginning operations by May or June of next year. Myles explains the majority of Skyservice’s capital investments are put toward equipment, training and tooling, which ultimately creates commonality and efficiency among its facilities. This approach resonated back in October 2017 when the company’s four locations were the first Canadian FBOs to join World Fuel Services’ Air Elite Network of Diamond Service locations. The Air Elite Network, established in 2011, is now comprised of 77 FBO facilities worldwide. Only 17 new Diamond Service locations have been added to the network over the past seven years, as each FBO member must meet a number of airport, facility, and service quality standards, stretching beyond clients into pilot and crew considerations. Even with the focus on creating facility commonality, Myles explains each Skyservice location is a bit different in its design, largely because of when each were built. The new Toronto location, which will be conveniently next door to Greater Toronto Airport Authority’s administration building, will include some adjustments to meet the modern needs of business aviation. “The size of the ramp has become very important over the years, because business airplanes have been getting bigger. People and companies are flying larger airplanes and you need a bigger footprint. Hangars themselves are being built higher, bigger and wider,” Myles says. “The [Toronto midfield hangar] is about 15 years old and the height of the doors are about 28 feet. Now we are looking at mid-30s in terms of height, because of the new planes like the Global 7500.” Skyservice is an authorized service facility for Bombardier, Gulfstream, Falcon and Embraer. Considering the new hangar will be close to 100,000 square feet, with current construction prices in Greater Toronto, Myles estimates the new facility could easily cost anywhere from $50 to $60 million. Looking at the current employee count at Toronto midfield, he expects there will be as many as 100 people employed in the new facility when it is up and running. Supporting this outlook with more than seven years of data, Rolland Vincent of JETNET iQ in mid-2018 noted how an excess of pre-owned aircraft had slowed the market in the past, but that JETNET is now seeing consistent improvement in inventory with numbers of available aircraft getting lower every year. “In fact, last year there was quite a dip down. We had quite a few transactions… 2018 we think might be a little slower [because] there is not as much good inventory – fresh inventory – for sale,” said Vincent. JETNET iQ looks heavily at the pre-owned market because it provides a better pulse for the industry, as opposed to relying solely on quarterly order and backlog reports from large public aerospace companies. “The uptick in 2017 emptied a lot of young inventory out of the market, so right now if you are looking for a pre-owned aircraft less than 10 years old. There is nothing out there,” said Vincent. He also notes that among the five largest business aircraft OEMs – Bombardier, Dassault, Embraer, Gulfstream and Textron – only Bombardier and Gulfstream have any meaningful order backlog greater than three months. In his keynote, Vincent also expressed the growing value of airport property. With the lack of pre-owned aircraft supply, Skyservice now works with clients on what it refers to as acquisition agreements, where the company will find an airplane for the client, because of the lack of choice and availability in the market. All of these trends in business jet sales, inventory, pricing and manufacturing point to a healthy economy for business aviation and ultimately Fixed Base Operators across the country. 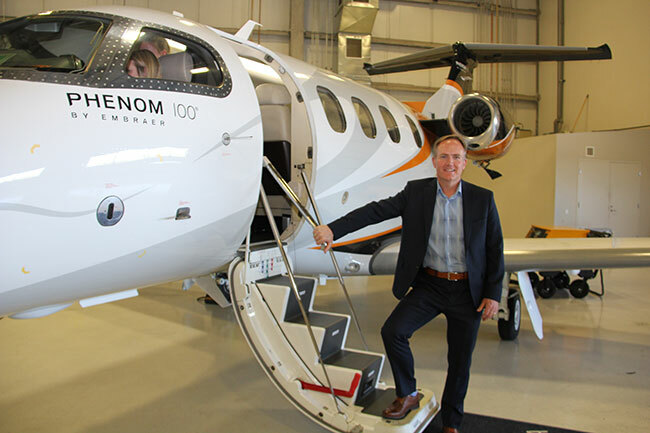 This optimism also speaks to expansion plans of younger operators, notably Kreos Aviation in Saskatoon, Saskatchewan, which has been operating its FBO for seven years. Kreos is a family-run operation that actually began in 2009 to focus on charter services. Kreos has since become a quiet force in Canada’s FBO market, with its unique focus on community. Kreos is set to expand its approach to a new location in Regina. “We are just a little bit different than most of the FBOs that are owned by the fuel or under the same umbrella,” says Sherry Franks, manager of Kreos’ FBO. She describes the like-home approach of the company, which includes decorating its Saskatoon facility with local art. Kreos’ current facility now holds close to 50 employees across its FBO, maintenance and charter segments. Construction on its new facility northwest of the main Regina terminal is underway and scheduled for completion by July 2019. Plans are to include a 4,800-square-foot executive passenger terminal, a 20,000-square-foot hangar, and 7,000 square feet of office space. Wings FBO survey was designed to identify properties that deliver on important value propositions for clients of these operations. For the ninth consecutive year, we asked readers to identify their top Canadian FBOs, fuel cards or credit cards. 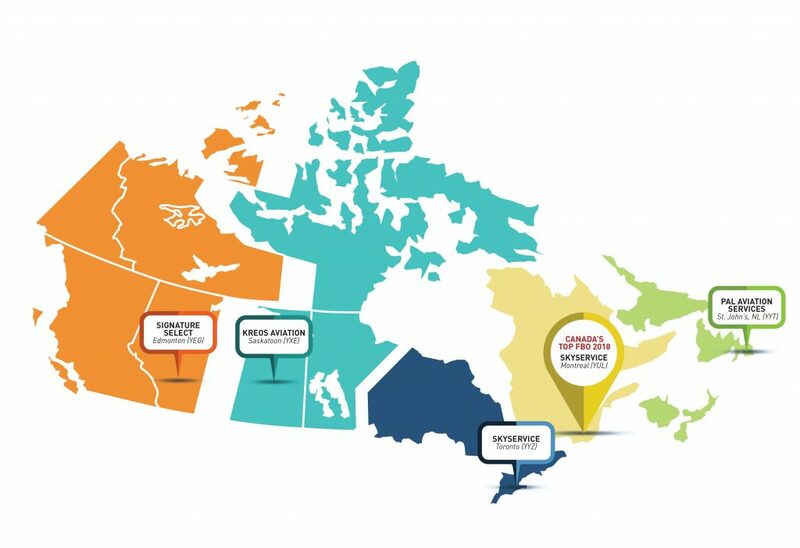 In an industry driven by service impressions as well as price, the survey offers a unique overview of the Canadian market. The survey was conducted online for six weeks from late May to early July. Respondents were allowed the opportunity to select their favourite FBOs and rank them based on everything from service and pricing to the various aspects of the venue. With the end scores tallied, we then were able to see how the selected FBOs rated overall for their markets – both in the number of times they were selected and in the total scores by attribute. Of the FBOs receiving votes this year, winners were selected in predefined regions across the country. As in past years of the survey program, this resulted named the Top 5 in each region, as well as Rising Star Award across the entire country. The Rising Star Award is based on the FBO that received the highest jump in votes from this year compared to last year. 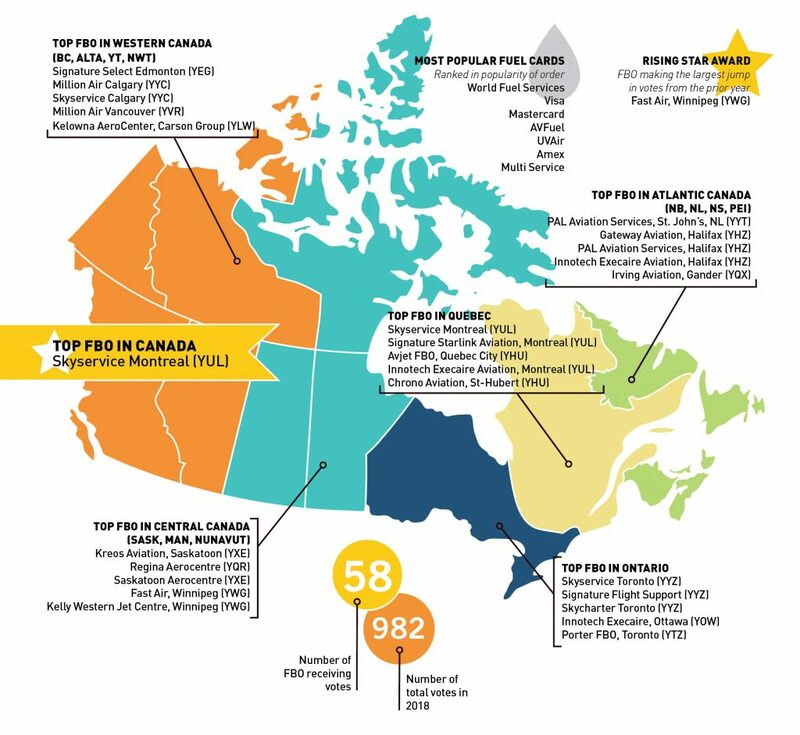 An overall winner as the Top FBO in Canada was then determined based on the total votes cast across all regions.